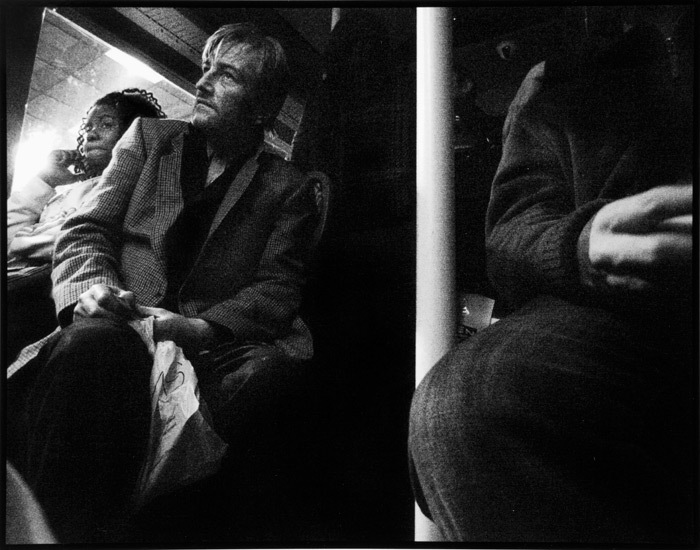 On board a 38, Tysoe Street, Islington. 2005. Photo © Tim Marshall. When I started writing this book I was living in Tufnell Park, in a flat bang opposite the tube. Hulking, over-sized overfed double-decker buses on route 134 to Archway drove past our kitchen window every hour of the day, creating a thrum and a hiss that was impossible to ignore. Around the corner, fractionally our of view and completely out of earshot, the 390 Routemasters ploughed back and forth to King’s Cross, in their own quietly efficient and self-effacing way. Most mornings I used to catch one down to the British library near St. Pancras, savouring the pleasures of the ride, before spending the day browsing self-published pamphlets on the Greenline service of the 1960s. On my walk to the bus stop I’d usually see an elderly derelict, his hands always encased in oversized industrial rubber gloves, clinging on to the railings near the Spaghetti House restaurant on the corner of Fortress Road. Ahab on the slipstreams of the A1, his mornings were devoted to staring at the flows of traffic that passed before him. Usually a sage-like observer, indifferent to the sirens, beeping horns and screeching tyres, he would intermittently be roused into rage by particular vehicles. Refuse lorries caused him no end of dismay. Later in the year I moved to Stoke Newington but a few weeks afterwards I had to return to the old flat to pick up some post. Coming out of the tube on a grey autumn afternoon, I found old rubber gloves was still there; this time howling like a banshee at a brand new double-decker on route 390. He sounded as if he was in pain, but then he’d always sounded that way. It’s easy, perhaps, to read too much into these things.